Melanie has been involved in water and land use policy for nearly 25 years, bringing significant funding for and national attention to the Los Angeles River. She organized the Coalition for a State Park at Taylor Yard, led stakeholders through the development of the Tujunga/Pacoima Watershed Plan, and established the innovative urban acupuncture program, Water LA. Johnathan focuses on nature-based solutions that promote the regeneration of healthy environments and systems. His work concerns regional planning, research, strategy development, and landscape management practices. He has a Bachelor’s of Landscape Architecture from Ball State University, and a Master’s of Landscape Architecture from Cal Poly Pomona. Levy is a native Angeleno who recently earned their Bachelor of Science from UC Davis, where they worked closely with the University's Arboretum & Public Garden honing their understanding of horticulture and CA native landscapes. They are deeply passionate about sustainable environmental design, creating climate-change resiliency, and healthy ecologies. They are eager to apply and expand their knowledge with The River Project to help develop livable, sustainable communities. April was born and raised in Los Angeles. She earned a Bachelor of Arts in Environmental Geography from California State University of Long Beach as well as a minor in Communication. She is determined to pursue a career where she can connect people to resources and advocate for environmental sustainability. She is excited to further advance her knowledge and passion for the environment with The River Project and inspire others to do the same. Ivan was inspired by his father to earn his Bachelor of Science in Landscape Architecture at Cal Poly Pomona. 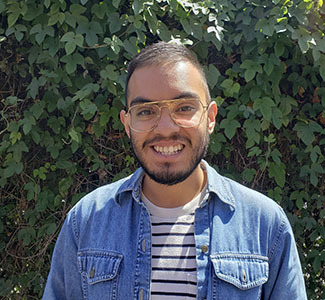 He aspires to advance environmental and social justice issues by designing and implementing strategies that realize regenerative, native landscapes. Empowering communities to engage directly in planning and design has always been a central priority, and he’s excited to work with The River Project to apply his passions to his practice. Born and raised in the San Fernando Valley, Saul has been studying indigenous, regenerative, ecological practices and installing California native and edible community gardens for 10 years. Previous experience includes wildland firefighting and building backcountry trails with the US Forest Service, and work with sustainable landscaping companies. He seeks to create healthy, accessible spaces to benefit communities that have largely been underserved. Brisa is a fourth year UCLA student working towards her degree in International Development Studies with minors in Environmental Systems and Urban Planning. She is passionate about environmental justice and community empowerment. Post-college, after refining her understanding of global social and environmental issues, Brisa aspires to earn her masters in Urban and Regional planning to create hands-on change to help create sustainable and equitable cities. Maisie found The River Project in 2013 after spending a few scary months on the streets alone. Her mission is to spark happiness, build bridges, and foster collaboration among her human friends. She takes pride in her therapy dog status, and wants you to know that apples are her most favorite food. Martin was born and raised in Philadelphia. He has a Bachelor’s degree in Accounting and Economics and a MBA from Carnegie-Mellon. He began his career as an auditor with Price Waterhouse, and worked at several Fortune 500 businesses and not-for-profit organizations. Martin is excited to use his skills and abilities to perform services for the greater good of the environment.